For the last four days, for just two hours a day, a big chunk of the center of Lyon has been converted into a kind of artsy urban theme park. The theme is light – illuminations, light sculptures, and short films projected against every convenient large flat surface. It's the Fête des lumières! It is something to see, a French city emptied of cars and buses, surrounded by soldiers, and packed with people – several million people – wandering around, sipping hot wine, and taking what must be some desperately bad cell phone photos of light-based art exhibits. I know most of my photos were awful. This one is not bad. 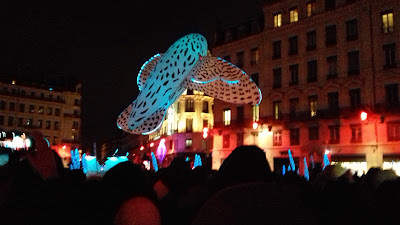 An example of a light sculpture, the flying fish flapping around. Or perhaps it is a bird, since I know, in spite of the bad crowd, that there is a nest in middle of the fountain, because I saw people constructing it earlier in the week. I know there is a fountain because etc. This is one of the pleasures of living in Lyon, witnessing not just the festival but the preparations for the festival. To see a bubble appear around a fountain. The short films attract large enough – enormous – crowds that I was being literal about the theme park. Ordinary city streets are converted into cattle chutes, or whatever they call the crowd-control corridors at Disney World. Get in line, wait, advance, wait, and emerge in one of the big city plazas to watch the cartoon. The highlight for me was the tribute to film (visible on Youtube) that made simultaneous use of the facades of the City Hall and the Art Museum. Only in France would the films selected for a cute cartoon make a pretty decent syllabus for an Intro to Film course; only in Lyon would the spectacle start with a long excerpt from Workers Leaving the Factory, the first film. Curiously, the festival has a religious purpose as well. The first sign that the festival was upon us was the appearance of the illuminated words “MERCI MARIE” on the hill over the city. A religious procession mounts the hill and thanks Mary for protecting the city from pestilence and revolution and so on. I glimpsed the procession on Friday while helping build a candle-sculpture at the base of a Roman amphitheater. You can see the shape of the head, yes? That night, the wind and rain and sleet were so bad that there were not many candles lit when we gave up. Saturday, the weather was good and the artist was more ambitious, so it was a solid two hours of lighting candles with a gas campfire starter. I am not sure what the design is, exactly, because by the time we had the whole thing lit, the crowds above us were too thick to bother with. I was supposed to help again tonight, but the weather was and is too miserable. Still: constructing candle art that a million people will see in a Roman theater while a procession of priests pass by – when else will I have the chance to do this? The Lumière film festival is wrapping up as I write. 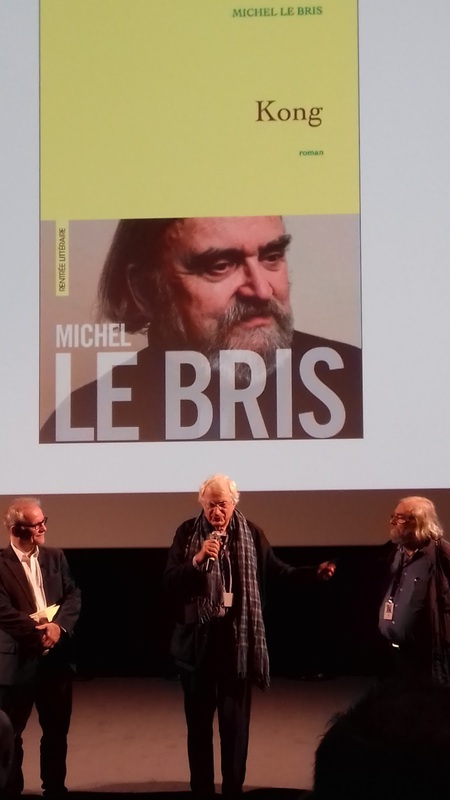 Lyon is the city where film was invented, more or less, by the Lumière brothers, and the festival, a recent invention, only in its ninth year, is a tribute to that history. It is not a showcase for new films, but a massive course in film history, from the French perspective. The big – or biggest – retrospective features were for Wong Kar-wai, Henri-Georges Clouzot, and Harold Lloyd, which gives an idea of the scope. It is a festival where five thousand people fill a giant hall to see Wong Kar-wai’s In the Mood for Love, and on another night five thousand fill the same space to see The Lion King. I have perhaps alluded in the past to some aspects of French culture that I envy. The Lumière festival was in this sense a painful week for me. I will describe a single event. 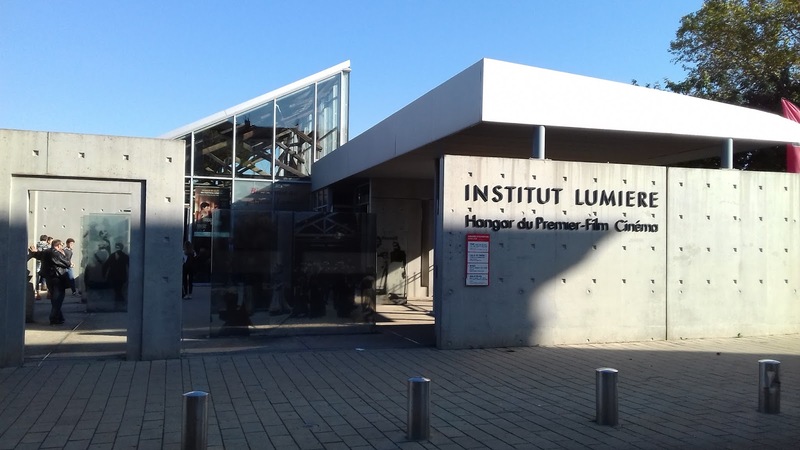 Here we see the Hangar of the First Film at the Institut Lumière. The festival’s screenings are scattered all over the city, but this theater is the headquarters. The movie theater is literally built on the site of the first film, Workers Leaving the Factory (1895). The theater is built out of and around the remnants of the building featured in the first film ever made. I mean, come on. I am going to see King Kong (1933) here. I had already been here, before the festival, to see the restorations of Jean Vigo’s L’Atlante and Zero de Conduite. The regular programming of the Institut Lumière is a year-round film festival. On the left is the director of the festival; in the center is Bertrand Tavernier, president of the Institut and one of France’s greatest living directors; on the right is Michel Le Bris, who is talking about (see screen) Kong, his new 950-page novel about the directors of King Kong. Le Bris is among other things a Robert Louis Stevenson expert. How I would like to read this book. Maybe someday. My point is that at a screening of King Kong, the first twenty minutes are spent in the discussion of a novel, and the film itself is discussed as if it is something serious, as if it is a work of art, and this is all taken as entirely normal not just by the film buffs but by a hundred or two French school kids. To top it off, Tavernier, who presumably has things to do, sits down to watch King Kong with the rest of us. Afterwards, on the way out, I speak to him. I tell him that he had created a beautiful film festival. The Frankfurt Book Fair originated soon after the invention of the Gutenberg printing press. I recently browsed through a history of early modern publishing that used the Fair’s records to quantify 16th century international publishing, the early years, circa let’s say 1570, when Venetian publishers brought a total of forty books to the fair, and Dutch publishers brought another thirty, and so on, an international book fair with a hundred books. Now, well, this is one of three floors of the English-language building, with the enormous Harper-Collins campus sort of visible in the upper right. Or maybe fortress is the right word, since it was the least welcoming space at the Fair. The books were present as samples for the salespeople to use. The fortress was full of little tables, each one the site of some kind of meeting. The Frankfurt Book Fair exists for the purpose of facilitating meetings, at which the rights to publish books are sold. Not books, but the rights to books. Deeply interested in literature but not so much in books, I experienced the Fair as a great mystery, less of a glimpse behind the veil than a sustained look at the veil. I still don’t really understand what is behind it. But if I wonder why was this book translated instead of that one, why is this book available in the U.S. but not in England, why does this book exist at all, much of the answer was there in Frankfurt. A Random House rep met with a Catalonian publisher, and said yes to this book and no to the rest of the pile. Who, away from that little table, really knows why. Lots of reasons. At the Fair, I got to see all of this without understanding it. Three big floors of English-language publishers, two floors (plus) of German publishers, two floors (plus) of the rest of the world. 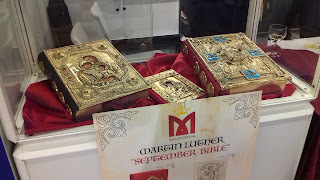 And additional areas for scientific publishing, education, religion, travel, maps, greeting cards, and an endlessly interesting area filled with nothing but art book publishers, including the strange subset of publishers of facsimile editions covered in gold and jewels. Part of why it was so interesting to me was that I did not need so much German among the art books, I admit that. The Fair would have been a lot more fun if I had German. This is also why I kept returning to the food and cooking area, where there were samples, wine, and a demonstration kitchen where the default language was English. Plus, I mentioned samples? The biggest celebrity I saw just wandering around was Dany Laferrière, the only Academician I have seen in real life. I saw Péter Nádas being interviewed for a television program, and stumbled across Wim Wenders plugging his new book. Meine Frau came across Reinhold Messner, who beats the others, I think, as a celebrity. More pleasurable was meeting Lisa of Lizok’s Bookshelf, who was at the Fair fighting the good fight for Russian translations. Thanks for the time and conversation, Lisa! 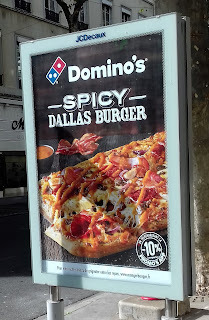 The point of photographing this horror, advertised all over Lyon, is not to note that potheads are everywhere but rather to puzzle over the culinary associations French marketers attached, and expect some segment of the French pizza audience to attach, to the word “Dallas.” Does the city go with “spicy”? Or “burger”? Steaks would not be so strange, in a generalized Texas sense. The café chain Flunch has a Tennessee Rosti Burger that is just as puzzling. The rösti is Swiss, and Tennessee evokes – nothing at all? 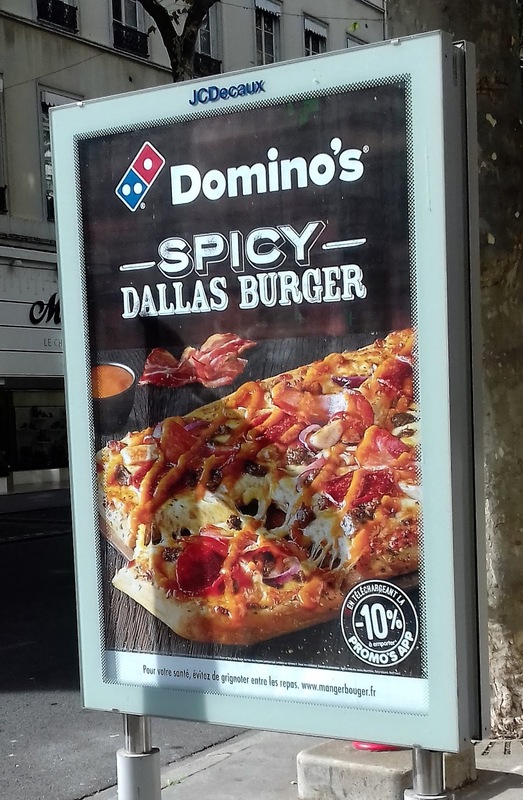 Maybe the burger is tobacco-flavored. Memphis, now Memphis has a lot of associations, not one of which are present in the Tennessee Rosti Burger. Someday I will write something about food I have actually eaten in France, good good food. “The food” is good in France, I am told. And it is. After a month in Paris, we have relocated more permanently to Lyon, long known as the “gastronomic capital of France,” which sounds like the food here ought to be even better. Arguable. Arguable both ways. The nutshell story of Lyon is that a generation or two of chefs, mostly women, converted a regional urban cuisine into high culinary art and in their restaurant kitchens trained a couple of generations of chefs, mostly men, who continued and extended the tradition. Many of the chefs were part of the nouvelle cuisine movement of the 1970s, an innovative time in French cooking. At a street food festival I acquired a piece of propaganda about Lyon’s food that is full of statistics. Four thousand restaurants in Lyon, or one per 334 people. Michelin stars: 23, three of them belonging to the legendary Paul Bocuse, making Lyon the fourth-most “starred” city in Europe, greatly disproportionate for its size. 477 bakeries, 298 butchers, a paltry 28 fish sellers, but Lyon is not exactly near the sea. I have little idea what these numbers actually mean. The density of restaurants does feel thick compared to anywhere else I have been in France, and the bakeries do feel like they are on every other corner. Lyon’s reputation as a restaurant city means it gets massive numbers of restaurant tourists, thus supporting not just all of those Michelin stars but several more levels of restaurants, including the famous bouchons, specialists in a particular strain of traditional Lyonnaise cuisine. For writers like Ruth Reichl or Elizabeth David, this food is not especially good, heavy and brown when good food should be light and green. I love it, but how often can a person really eat at such a place? Sausages, liver, tripe, huge amounts of butter – I would quickly develop gout. Similarly, what do all of those Michelin stars have to do with me? If I ate at those too often, I would quickly develop poverty. (Please click on “À LA CARTE AND SET MENUS” to see a PDF of the current menu at Paul Bocuse). It seems that Lyon has become in some ways a kind of restaurant museum city, providing perfect copies of a range of classic dishes rather than innovating. On an individual level, of course, who cares? Cooking is in many ways the art of the perfect copy. 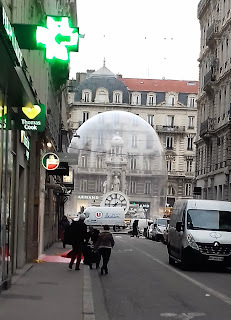 Lyon did add an innovation to French cuisine recently. The taco Lyonnais was invented circa 2001 in a suburb a bit west of me. It is a North African sandwich, meat and cheese wrapped in a flatbread and grilled in a panini maker. It thus resembles a Mexican-American burrito quite a bit, a Mexican taco very little. How the word “taco” got attached to it I do not know, but the sandwich has permeated not just Lyon but France more generally. 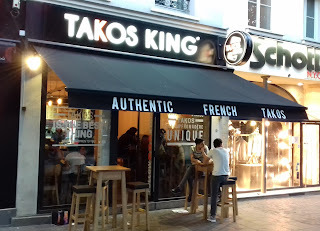 See, for example, Takos King, in the Place Joachim-du-Bellay in the center of Paris, the home of “Authentic French Takos” which promise, on the left, to be “The Best Thing That Will Happen To You.” Just to the right – I took a photo but sadly it stinks – is an O’Tacos, which on that August evening had a long line. 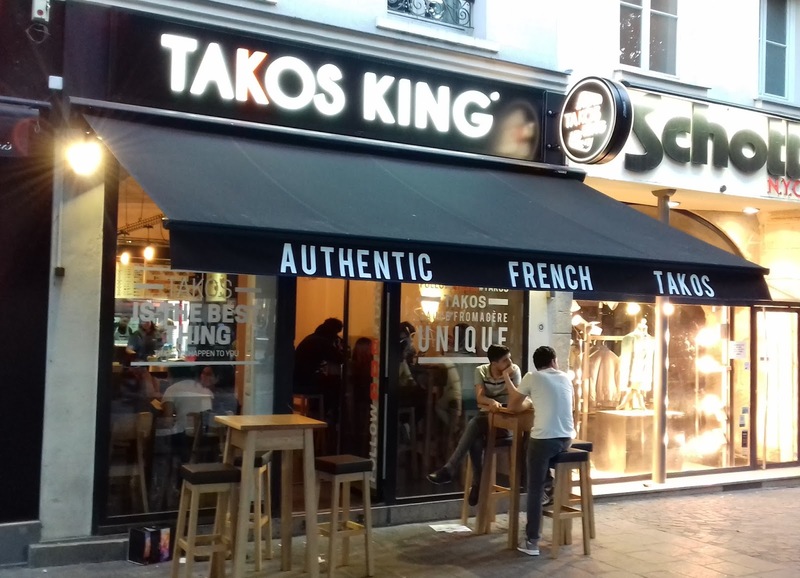 O’Tacos is a franchise that has dropped the identification with Lyon, and has made its own innovation with the Gigataco – more than two kilograms! – and with, I wish I were kidding, eating contests. The taco Lyonnais is now established French food, even if it is not eaten universally. My guess is that people with or who will soon have high blood alcohol levels make up a lot of the customers at O’Tacos. But it is part of “the food” in France, which is perhaps not always good. I went to a museum or museum-like location almost every day that I was in Paris, sometimes, even, if they were small enough and I was fool enough, two a day. I have now been to a small fraction of the museums of Paris. The Museum of Art and Design had the first airplane to cross the English Channel (the top one pictured, I think), and a steam-powered bus that was the first motorized vehicle allowed to drive in Paris, and a diving suit that never worked but looks cool, and, what else, Lavoisier’s test tubes, and a display of the evolution of the eggbeater, not prominently featured, but they had it. This is basically the French patent museum, full of prototypes, dead ends, and revolutions Amply strange and fascinating. It’s the Infernal Machine – each pipe is a firearm – that nearly assassinated King Louis-Philippe in 1835, and did kill eighteen other people. A hand-constructed, terrible object, not a facsimile but the actual fragment of history, set out among the charters and constitutions for some reason. The museums of Asian and Pacific art were as strange and fascinating as anything in Paris. The small-scale Musée Cernuschi, the Guimet (ancient) and Quai Branly-Jacque Chirac (more recent). What Surrealist ever bettered the wooden Melanesian reliquary, part tuna, part shark, impaling a little man on its beak, and containing a human skull. This object did not come to Paris until 1935; the Surrealists who saw it must have despaired. The objects in the Western and non-Western museums are in deep conversation. The 1845 J. M. W. Turner painting at the Louvre (right), which I swear looked more orange in person, and this Australian dream painting by Mick Namarari Tjapaltjarri, which depicts the dream of a mouse (below), seemed to have a lot to say to each other. Formally, I mean. When I came across the latter, I thought “Didn’t I just see this at the Louvre”? 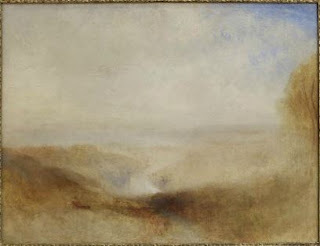 That Turner was the last painting I really saw at the Louvre. Where I got the strength, I do not know. It was getting late, the crowd had become preposterous, and I was no longer looking at art but at people looking at art, or more precisely at people taking photos of people taking photos of art. And who could blame them. I was in the long red gallery filled with the most famous French paintings – Gericault’s “The Raft of the Medusa,” Delacroix’s “Liberty Leading the People,” and Napoleon in a number of monumental scenes. How is anyone supposed to actually look at these things, as paintings, as art, even without the company of hundreds of other people. We were mostly there, like those in line to see “Mona Lisa,” to acknowledge the celebrity of the paintings. When I start thinking like this, it means my vitalities have been plumb burnt out, and the smart thing is to trade the museum for coffee, which is what I did. Paris is empty in August, I read, a “ghost town.” It is like having it to myself. “Everyone” goes on vacation for a month. I am Googling around, finding these descriptions. Sure, I think, except for all of the people, and I do not mean the tourists, who are thick on the ground but in predictable locations. But everywhere I go, Paris is full of people. I like to think I know how hyperbole and metaphor work, but a metaphor should mean something, yes? The stark exceptions are the residential and moneyed 16th and 17th arrondisements. Some fraction close to “everyone” may well be away. In the 13th arrondisement, in the southeast of Paris, where I am staying, “everyone” is far from everyone. I have been confused since our first night here, when the Tuesday-night crowd at Bercy Village, a line of restaurants tucked into cute little 19th century wine caves, looked exactly like, and presumably were, young professionals having dinner after work. Just as the even younger crowd having lunch outside of the Create Zone, Share Zone, and Chill Zone, “the world’s largest startup campus,” look like they work there. Or chill or share or whatever they are do. They are not on vacation. Nor are the dozen or more African immigrants, all men, wandering around the Champs du Mars with their plastic Eiffel Towers on wire rings. I suspect that their vacations are more accurately called “seasonal unemployment.” I wonder who they work for. When someone says that Paris is “empty,” they are not counting any of these people. I believe it is the roof of the Chill Zone visible in the view from my apartment window, at the bottom. On the left are two of the four towers of the National Library, and on the right a glimpse of the other two; in a better view they would look like open books, set on end, maybe. The structure in progress is one of a long line of post-modern apartment buildings, classic decorated boxes, being built atop the train lines running south form the Gare d’Austerlitz. I would not call Paris a construction site, any more than I would call it empty, but construction workers are another group not on vacation. I have no idea what any given neighborhood looks like normally. I’ll have to come back some time to see. Meanwhile, I am enjoying the relative emptiness of the city by bicycling all around it, trying to learn how the pieces of the city fit together. There is no good substitute for physically moving among spaces. Well, maps are a good substitute. There is no great substitute. I hope that in novels, history, and news stories, Paris will now have a new concreteness for me. Who knows. I’m covering a lot of ground, at least. The greatest danger of bicycling in this city, at least in the lighter August traffic, is that there are too many distractions. It is all too continually interesting. He saw a countryside without cholera or revolution, but he found it sad - how, Giono asks, should a man live? It had been niggling at me, as I read The Horseman on the Roof, that original as the novel was it did, in places, sound a lot like someone. Its imagery was a blend of a long French tradition, from Flaubert through the Surrealists, and its hero was straight out of The Charterhouse of Parma, but – well, see above. In the penultimate chapter, Angelo and Pauline, on the edge of the cholera outbreak, are caught in a rain storm, and accept the hospitality of a doctor, a theorizing loudmouth. Our hero and heroine, stupefied by a fire, and wine, and good food, collapse – “[Angelo] could well imagine how with a little stew at the right moment all the heroes and heroines of Ariosto could be brought down to earth and reality” (394) – and just let the doctor talk, on and on. Artistically, the chapter seems like the novel's one dud. But it confirmed my idea that Giono had been thinking about Hugo. It is in effect the only digressive chapter in the novel, the only time Giono allows a detached voice to take over, even if the voice is nominally that of a character. I wonder what the character has been reading. If the time of the story is 1832, Hugo is famous enough as the author of Notre-Dame de Paris, Hernani, and several books of poems, but for Giono’s readers the name must invoke later novels directly relevant to this novel, like the man-against-nature Toilers of the Sea or Les Misérables. Cholera-stricken Provence is full of miserables, and Angelo is something of a Jean Valjean figure, trying to find a way to turn his impulse for heroism, his ethics of heroism, into something that is actually useful. The Hugo-spouting doctor is the last of a series of role models that Angelo encounters. The first was also a doctor, the “little Frenchman” who sacrifices himself in a hopeless search for the one victim who can be saved. The most dramatic is a gigantic nun who wanders Manosque, cleaning corpses, restoring dignity. Angelo joins her, unsure if there is any value at all to the activity, but at least it is action. (The most charming role model is the cat who joins Angelo during his exile on the roofs of Manosque). It is as if Giono needs a role model of his own, for his fiction, a writer for whom Angelo’s struggles with heroism would make sense, even if the non-naturalistic way that Angelo debates himself often sounds more – surely is – the product of Giono’s time. The Horseman on the Roof is an easy book to recommend, artful and exciting, and probably not just for tourists going to Provence, although they need it more than anyone. The Horseman on the Roof is full of magnificent, original imagery of the Provence landscape. The story is about Angelo, the horseman, trying to avoid quarantines, murderous mobs, thieves, and cholera, the latter the cause of all of the former. Meanwhile, earth abides. Perhaps there is irony here. Giono’s numerous, repulsive descriptions of death by disease are not exactly clinical, but nor are they voyeuristic. Death by disease is part of nature. The novel is full of nature. The slopes poured down into the valley the stale reek of everything that had died within the vast radius of these pale hills. Tree stumps and skins; ants’ nests; little cages of ribs the size of a fist; skeletons of snakes like broken chains of silver; patches of slaughtered flies like handfuls of dried currants; dead hedgehogs whose bones looked like chestnuts in their burrs; vicious shreds of wild boars strewn over wide threshing-floors of agony; trees devoured from head to foot, stuffed with sawdust to the tips of their branches, which the thick air kept standing; carcasses of buzzards fallen into the boughs of oaks on which the sun beat down; or the sharp stink of the heated sap along the hawthorn trunks. This is some mix of close observation and hallucination. Provence is consumed by death before the cholera comes (it comes in the next paragraph). “The heat reached [Avignon] the same day, and its first blasts crumbled the sickliest trees” (16). Then comes the nightmare in the Orange train station I quoted yesterday, and a series of other horrors. His eyes had been shut for an uncertain length of time when he felt himself being slapped by downy little paws, struck painfully about the temples, and claws raking through his hair as if someone were trying to plow it up. He was covered with swallows, which were pecking at him. They thought he was a corpse, as was entirely likely. Even more horrifying is a later passage in which the butterflies, “yellow, red and black, white ones spotted with red, and huge ones, almost as big as sparrows,” become a menace, or at least, in this world, feel like one. Later, though, viewed from above, “[t]he butterflies sparkled like sand” (332). The great beauty of Giono’s descriptive writing is thoroughly mediated, ironicized, and distorted. The historical event, the epidemic, allows Giono to use the landscape in which he spent his whole life without the usual sentimentality. The result is the perfect book for Provence tourists with a sense of history and irony.